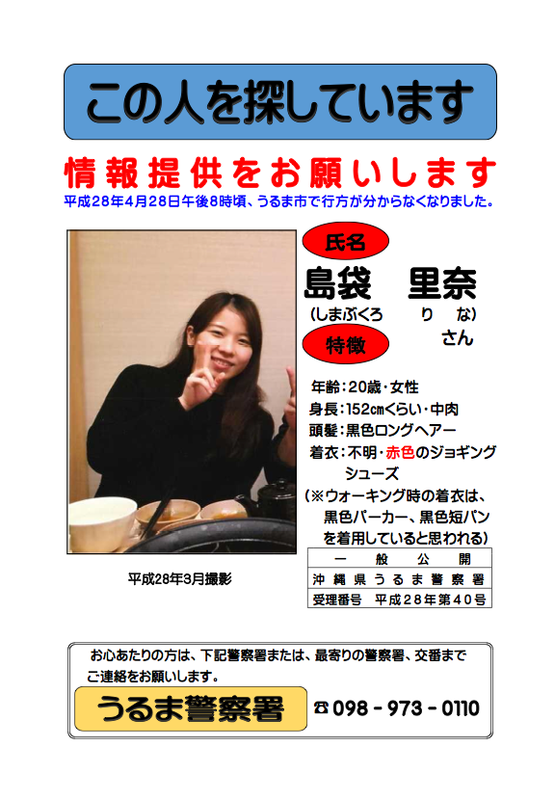 20-year-old Rina Shimabukuro from the Ota district in Uruma City, who works as a part timer, has been missing since Apr. 28th. Okinawa Prefectural Police made public the information about her on May 12th, asking public’s help to discover her whereabouts, because they suspect she may have been the victim of some kind of incident or accident. According to investigators, Shimabukuro left her boyfriend’s residence around 20:00 on Apr. 28th for a walk, and has not been heard of since. The boyfriend became concerned as she did not come back to the residence, and called police on the next day. Police investigation to her whereabouts is still going on, but had not found any clues about her as of May 17th. According to Uruma police, Shimabukuro is 152 cm tall and average weight. She has a medium long black hair with some brown streaks. She wore red jogging shoes. Usually she wears a black parka and black short pants when she takes a walk, but it’s not sure what kind of clothes she wore at that time. When she left, she had her iPhone 6 cell phone attached to a black keychain and her car key with her. The boyfriend sent her a message through a Line application around 02:00 informing her that he would be back soon, and he checked the message had been read, but he has not been able to make any other contact after that. She also had a Twitter account, which someone deleted on May 29th. Police say she left her wallet and car at the residence.